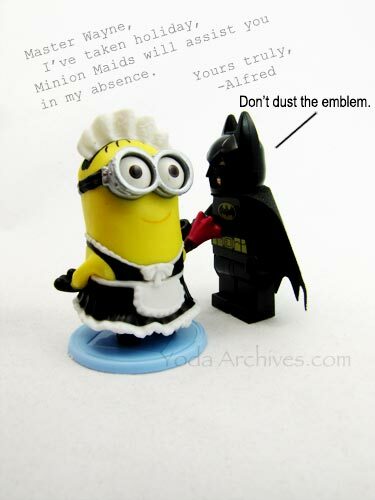 Yesterday I posted a pic of a Minion Maid mini figure. It is part of a ten piece Toys R US set. 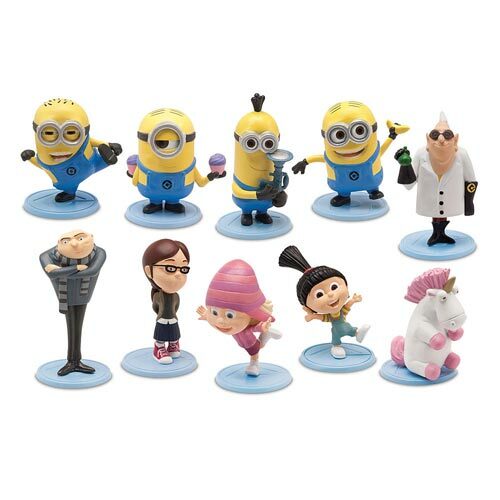 These are new Despicable Me figures. 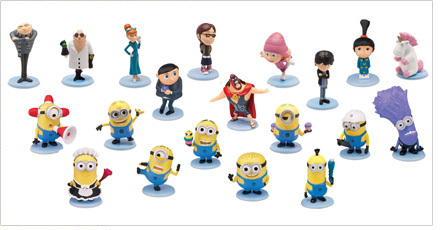 I did a little research and found out there are more minion surprise figures! Here are the blind bags figures that were released last year. They were sold in random blind bags for $2.99 each. Last summer I could only find them at K-mart and Toys R Us. Once the Despicable Me 2 DVD came out more stores had them but by then the price increased to $3.99. I never found a code for the blind bags. Toy R US 2013 boxed set. Still listed online. 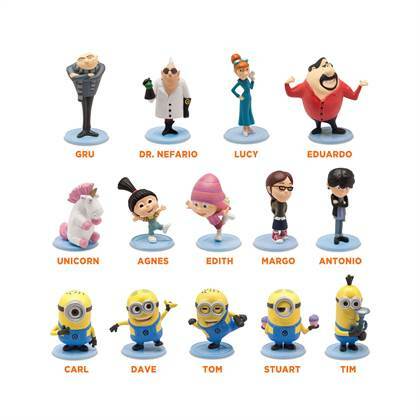 You can see it has all of the first series of blind bag characters except for Carl, Lucy, Eduardo and Antonio. The set was $19.99. Including The Minions – Dave, Tom, Stuart, Tim and Carl; The Girls – Margo, Edith and Agnes; Gru, Dr. Nefario, Lucy, Eduardo and Antonio, Unicorn. Each sold separately in a foil bag. This is what I found on Thinkway toys web site. The text is the same as from last year. The only change is they added “New Figures coming soon!” and “Release August 1, 2014” The first was last Friday. I have not seen the bags in store yet. I found the 2014 TRU Minion Made boxed set in late July. I didn’t know there were new bags on the way. And here is the thinkway Minion Surprise current picture. There are twenty figures in this shot some old and some new. There’s a mix of 2013 and 2014 figures I broke them down into the table below. I called them series 1 and 2 for sake of ease. I haven’t seen the bags yet. I hope the older ones are not mixed with the newer ones in the blind bags. I will let you know once I find them in store. Has anyone seen the new blind bags yet? UPDATE: I checked wal-mart they only had series 1. August 8, 2014 | Categories: Action Figures, Super Hereos | Tags: blind bags, Despicable Me, gru, minions, Surprise Minion | Comments Off on More Minion Surprise Figures! My alternative version of yesterday’s strip. The maid Minion came from a new Toys R Us set. I’ll have a new post on that set later today. August 8, 2014 | Categories: LEGO, Photography, Super Hereos | Tags: batman, humor, LEGO Batman, Minion Surprise, minions, new comic wednesday, web comic | Comments Off on Don’t dust me bro.